And, clearly, for all the Greek zombies who have waited a couple of millenia to see this day, it was worth the wait. For anyone else, it was probably greeted with a bit of a meh and a shrug of the shoulders. For me, well, I was just glad that I did actually survive. The race itself is fairly simple: you start in the modern stadium in marathon, run past the site of Battle of Marathon and it’s then a straight road through a few towns all the way to the Panathinaiko stadium in Athens, which hosted the first modern Olympic Games in 1896. It’s not a particularly good race for night-owls like me: you have to get a bus to get there and the last bus to leave town leaves at 6.30am (4.30am if jet-lagged like us). Ouch! A small snooze on the bus later and you reach marathon which, well, is in the middle of nowhere. This gives you over an hour to stretch, smoke (as some French runners were doing!!) or join the endless queues at the portaloos and realise you could make a small fortune by setting up a business selling toilet paper before international runs. 11,000 runners, 6 toilet paper sheets: not cool. What was cool mind you was warming up on the track alongside the elite runners. And, by that, I mean warming up for a split second alongside the elite runners while they casually whizz past you without a drop of sweat rolling down their forehead. Finally, just after 9am, we were off. I can spot myself in the background … but good luck trying to find me! The first 7km are flat and take you past the Marathon Tomb and a great number of olive and orange trees. Many people were handing out olive branches to runners which was a nice thought. After that, you all walk through an inter-dimensional space-warp and land in hell: a 25 (TWENTY-FIVE!) 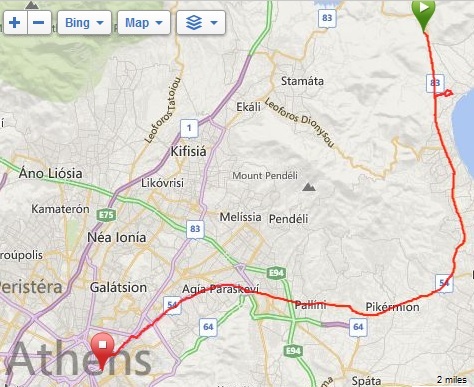 kilometre climb up to Athens in full sunshine and exponentially increasing heat. Ugh. Well, I lived…which I worryingly think is more than can be said for some of the other runners who were being attended to by paramedics at relatively regular intervals. Because I’d been pretty badly ill all of the previous week (stress-related dickie heart, rivers of snot coming out of my nose, fountains of phlegm shooting up from my lungs … oh, you were eating and didn’t ask? ‘Sorry’…), I was a little concerned I might be joining them so I’d got my phone with me to text Pippa a status report on whether I was still alive every now and again. Amusingly, you can see me reaching for my phone just after the half-way point as we veeeery slowly shuffle up hill. 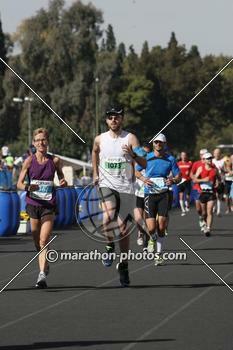 At 1h45, I was actually going at a respectable pace for a full marathon considering the hill. Yep, that’s right, I’m getting my mobile phone out during the race … but it is to let a loved one know I’m still alive so it’s just about acceptable. Finally, after 32.5km, you pass a typically-Greek church on your left and, joy and relief, it’s a mixture of flat and downhill running from there to the end. The last 500m were very much downhill (yay!) and the roads were increasingly lined by people which was appreciated to say the least. Then, with 200m to go, you get your first sight of the Panathinaiko stadium, the hairpin-shaped 45,000 seater stadium which hosted the first modern Olympic Games. 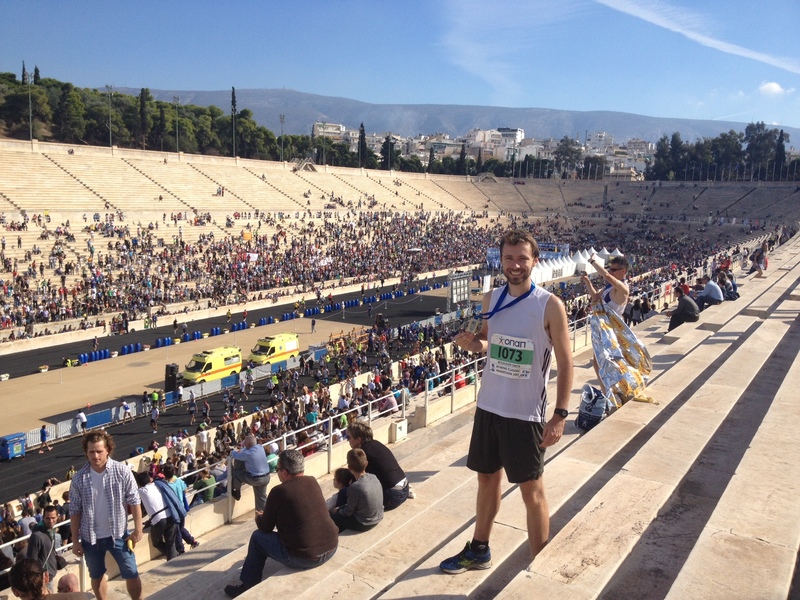 Admittedly, there weren’t 45,000 shrieking Athenian goddesses filling the stadium as in 1896 but there were probably a good 5,000 family members which gave it a great atmosphere and stimulated you (well, me) to bomb down the final straight with a definite sense of achievement. I appear after about 15 seconds – I’m the one in the white tshirt and black hat bombing down the middle. The overall winner won in 2h13 (not too shabby) while the final dozen finishers ended in about 8h10 (poor sods). Admittedly, one of the final finishers was born in 1931 so credit to him!! In all honesty, other than the start (which is historically cool) and the finish (which is historically and emotionally cool), the rest of the race is pretty boring with nothing much and no monuments/landscapes to look at. You can technically see the Acropolis from a distance in the last couple of kilometres (although your thoughts are elsewhere at the time) but, other than that, it’s pretty much suburbs, grass land and diddly squat to look at. 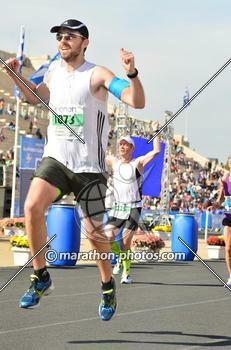 Nonetheless, the finish made up for it! After all that, I guess the real question should be … how long do I technically need to survive to be able to claim that I’m the first messenger to have survived this marathon? One week? One month? Ten years…?